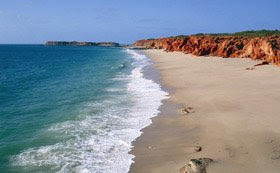 Today we are off to Broome - we have been going there for the past few years this weekend (it is a WA public holiday weekend) and this year we are driving from Broome to Cape Leveque. Of course there is much to do and it has been rather difficult to do it as some idiot truck driver drove a huge truck down Lincoln Street at 4am and wiped the power lines off and our power was off for 8 hours so we are running in circles to get all the orders out today - getting there though. I do have to say that my studio table is very tidy - we become so reliant on power that one has to think what things one can do when it is gone. I wanted to iron webbing to felt and stuff so am taking that with me - they will surely have an iron up there. I also wanted to do some things on the embellisher and the sewing machine this morning but not so. I found a few things I had not been able to find and at least had my arty stuff ready to take. Back on Monday night and looking forward to a wonderful relaxing few days - lots of books, stitching, sketch book , knitting needles, swimming and all that stuff. 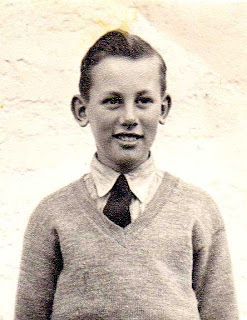 Happy Birthday Val - I hope you are having a lovely day today - you would think I would be able to find lots of photos but this one is pretty good - no-one need know it was taken quite a few years ago (that's because you wrote the date on the back). Have a glass of champers tonight and we will have a toast to you - not that we didn't all last night! Plus you and Jim have a wonderful trip and come back with lots to tell us. Margaret, Helen, Ann and Marion are here from Christchurch for a week (they go home tonight) and we have seen them a few times. Bruce came with us all last night for a meal out at the Phi Yen just down the road. This morning Ian took out to Sadleirs the boxes I had packed for the trade show in Sydney - not this coming weekend but the next one. STOP PRESS - under the pump just means under pressure - I have no idea where it comes from but it has been around for a long time so it may be aussie or it may be kiwi but it seems to be part of my existence. Okay - so the Hurricanes lost but the sun still came up and it will soon be next year. The Crusaders simply got themselves on fire and now I will support them in the final. Actually for anyone imagining that was enough of the rugby nonsense - the All Blacks play next. Sorry folks. 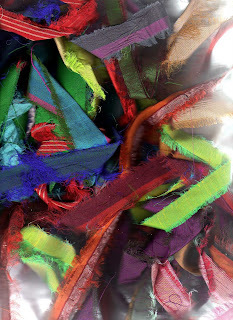 This week we received a huge shipment of sari ribbon and we have been busy updating the Sari Bits section on the web with new pics etc, so I thought I would iron out a bundle - all 50 metres - that took me quite a while I have to say. 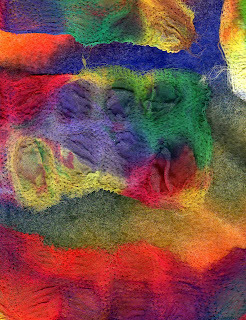 I have just tossed the pile on the scanner but then I have embellished them on felt. I love the way the fabrics have been torn so you get all the raggy edges. The embellisher is pretty quick to do this - about 10 - 15 minutes to cover the piece of felt. Good luck to the Hurricanes today - we are having a bbq between the two games - lamb chops and NZ pinot noir - what else? 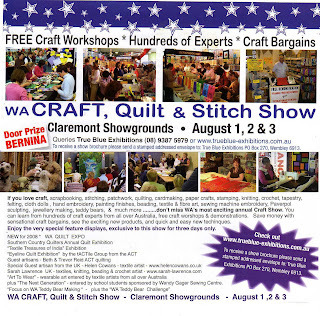 Mareene dropped off flyers for the Craft Quilt and Stitch Show in Perth 1-3 August at the Claremont Showgrounds. This is where we 'come out' and if you can read the fine print you can see we have 2 - yes 2 - (thanks Mareene) wonderful guests. Helen Cowans (and you can also see her lovely photo on the flyer) and Sarah Lawrence. Yes Sarah is coming back. Being the Wild Women Queen she will hopefully be bringing her collection including the ones in her book so I hope you are making lots of WWs to swap for the challenge. And Helen - aka Textile Goddess - will be showing her terrific skills and will be teaching her Flower Towers after the show. All the details should be on our website soon. I went to a 3 hour embellisher workshop tonight thinking I might learn something new and exciting but I have to say it was truly awful and I got bored very quickly. I hope all the people waiting patiently with their embellishers polished and their excitement at the fore (they are still VERY chatty on the Yahoo list) will enjoy themselves and learn new stuff. Believe you me, I am a nuisance when bored - but at least I came home to a nice class of red and a meal cooked beautifully by Ian. Lovely rain here still and may it last for a while longer. Very busy this week and if anything could go wrong today - it did. 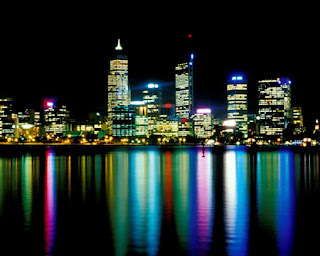 Here is Perth at night - it can be rather attractive - from the south side looking back across the Swan River towards town. This is the side Spaghi restaurant is. We are testing a new spam filter. It seems to be over zealous and one of our big suppliers can't get through to us so we are having to email them via g-mail. This has been one of today's time wasters. Lovely day today but I spent the entire day working in one form or another - satisfying to finishing winding and labelling one complete lot of threads all wound watching the rugby over the past 2 weekends. And a bit more. Followed the rugby until late at night so I knew the Hurricanes were in the top 4 - this morning discovered it was 4th so they have to play the Crusaders in Christchurch next weekend. All will be revealed then. 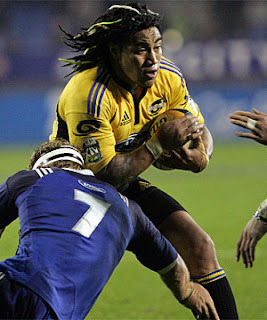 Here is Nonu in Friday's game. I hope he is all fired up for next weekend. Then I have spent the rest of the day on embellisher bits and pieces. One of the difficult things about teaching is deciding what to put where but I think I have lesson one all ready to put to bed. I have to finish the challenge first though. Can't have any of those chatty people slacking off once they start class. Last night we watched 2 very exciting rugby games - the Hurricanes and the Blues. Unfortunately the Hurricanes lost but it was such an exciting game. The top 4 teams will depend on all the other games so who knows? Then we watched the force and the Brumbies - thought it all over bar the shouting at half time but then the Force came back - so two good games. This is Hosea Gear who scored 2 quick tries. Still working on samples for the Embellish Stitch Enrich workshop. Texturizing fabrics at present. The more you play the more you learn what you can do. And the time it saves you in preparing stuff. I am finalising Lessons 1 and 2 - I think the people who have enrolled so far are waiting impatiently from all the natter on the yahoo list. I hope they are polishing their embellishers in anticipation. We had a very nice night last night at La Cascade - the food is always wonderful but always too much and too rich. You wouldn't want to go too often. Part of the time you spent trying to choose as it is all so good. Ian took the camera to Max's birthday but the battery was flat so he got a good photo of Max the next day. They all had a great night. 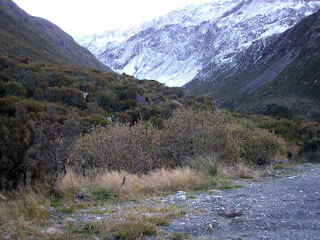 He drove back to Christchurch over the Arthur's Pass - we haven't been over there since sometime in the 80s as far as I can remember so we are both going to in the not too distant future. 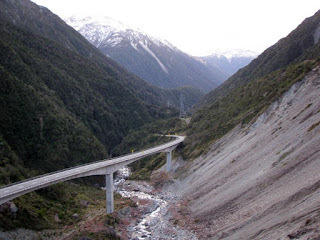 This is the viaduct - certainly wasn't there when we drove over when I was a child and we had to stop for my mother to collect fresh water to drink. My Embellish Stitch and Enrich has had plenty of interest but I am working away on new ideas and writing the lessons - that's how I work. Changes until the very last minute as the brain is always busy. I can wake up at night with another little idea to try. I have started texturing up fabric but no pics as yet. I got the latest Workbox magazine today and I am pleased to see a review of my book even if Victor did spell my surname wrong! We have had glorious rain - lots of it and may it last. We had glorious rain yesterday - in fact I was out and about and it was bucketing down and some stupid driver in a red sports car raced by me weaving in and out of the traffic and flipped himself/herself upside down. Luckily affecting no-one else. Some people have no idea. What am I reading? 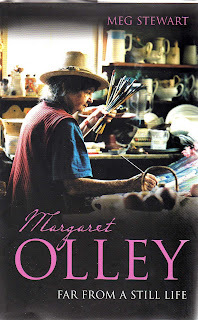 Far From a Still Life - the bio of Margaret Olley - I love her work. 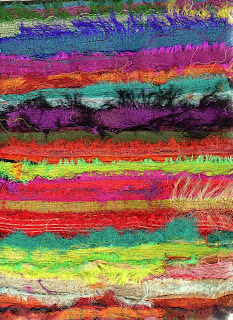 Here is part of a Splendiforous Surface - for lesson 2 of Embellish Stitch Enrich - lots more to do yet. Tonight we are off to La Cascade with Val and Jim - we used to go every year for Michael's birthday so it might seem strange but I am sure it will be a great night. 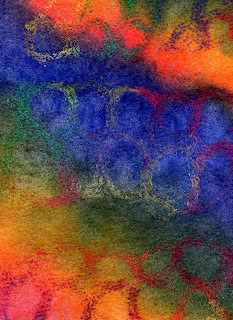 Here is a Splendiforous Magic Carpet - one of a new little series I have started. 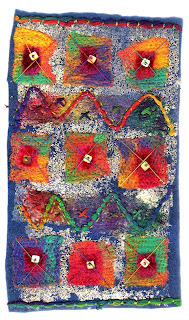 Embellisher and hand stitch and foil - I have finally finished my foil samples and sending them off to Yvonne today for an article in Machine Embroidery (and textile art). After a long search I found a few photos of Grant and Jarrad sailing on Lake Garda where they won the Riva cup in the 14fts. I love Barbara's work - she inspired me so much when I went to a talk she gave for OPUS when I was doing City and Guilds. 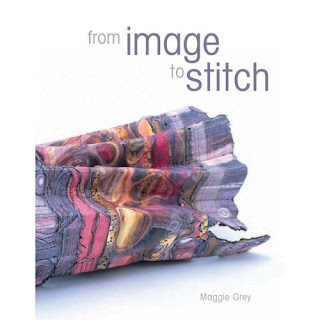 Introduced me to the idea of paper pulp and stitch and her sketch books/travel books were to die for. I am working on lesson samples for my on-line workshop - these are a couple of starters I am doing for my Splendiforous magic carpet. 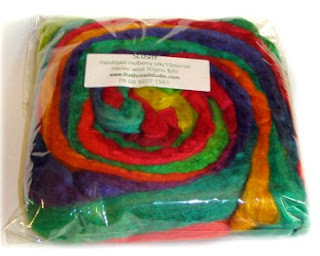 I am using the slushie in the bag from yesterday - not sure I will go back to wool for a while. These are glorious to work with - so soft and of course lots of the sheen of the silk with the very fine merino. Not very exciting as yet but then I shall cut them up. I have my usual huge stack of stuff out in the theme. This is not related to the dilemma piece which I am slowly hand stitching onto and then will make decisions. Thanks for the comments on my dilemma - I have started stitching on the subtle side but I still rather like parts of the other side. I shall keep working away and make a decision as I go and then I will show you - I am also working on a few patterns as well. Ian is back safe and sound - no artificial flowers on this trip. I think he is very impressed with my efficiency. I haven't managed to get him to load the Embellish Stitch and Enrich online workshop up on the website as yet but gee he can have a day off from that! Val was asking what a slushy was - she thought it might have been a nice drink. it's a wonderful combo of fine merino wool and mulberry silk hand dyed for us. Lovely to spin, use in water soluble, to make silk type paper and of course the embellisher loves it. This is Indian Splendour which I using for my little magic carpet. I have this beautiful piece of hand dyed felt onto which I have been working different silk fabrics with the embellisher. Obviously it is hardly started and I did plan to use the top side - above - but then I turned it over and found it is time for decisions. Maybe I will cut it up and use both sides - lots of hand stitching to go. Ian will be back tomorrow afternoon - what surprises can we have in mind? 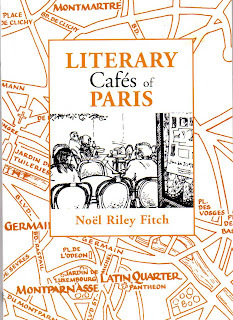 this book is another on Literary Cafes in Paris - we will indeed be busy for our week. Another gem to read before I go to sleep. Jacinta send another huge parcel of lovelies including lots of new slushies and silk tops and silk hankies and interesting fibre which she refers to as flea bitten stuff on her invoices. But we all know it is all fabulous fibre for all manner of excitements. In one of the parcels was a birthday present - what a lucky girl - it is a book of scripts etc - all sorts of interesting ones. Thanks so much Jacinta - I shall be scanning and playing - just what I need. 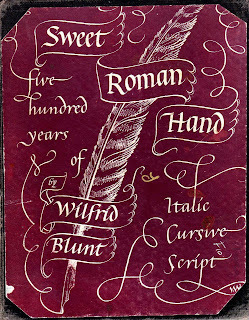 I love the one below - it is a Diplomatic Hand of the 11th century showing eccentricity - don't you love it? 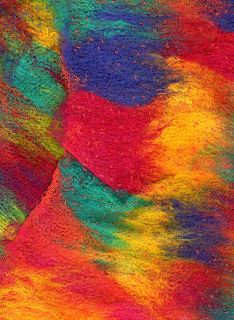 Then she included some yummy Indian Splendour dyed yarns - I am off to the studio to play on the embellisher with some silk on felt - be back tomorrow with the results. It's still in the head but after the foils. I can't photograph as Ian has the camera but last night for dinner I wrapped figs with prosciutto, topped with a little Gorgonzola and EVO and grilled for a couple of minutes. Served with rocket, pear and walnut salad. How's that for cooking for one? Last night I lifted the lid of the piano to have a little play and 3 hours later thought it a good idea to go to bed. It's been a long time and I am surprised I still know so much. Maybe it's my comeback. But the piano does need a tune. Today I played some more. The embellishment machine is a wonderful addition to one’s array of other textile equipment; the sewing machine, heat gun, soldering iron and so on. The name implies embellishment and needlefelting but used in conjunction with your sewing machine and hand stitching, there are so many other things you can do with it. You will soon find yourself wondering what you did before you had one. 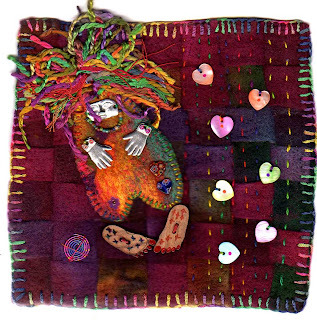 Obviously you will need a needlefelting/embellishing machine or attachment, a sewing machine and hand sewing needles to take this class plus an awful lot of other stuff you already have in your stash of goodies. beyond your machine and each lesson will include a challenge. 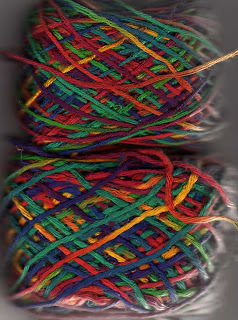 First Things First – lots of sampling with fibres, yarns and fabrics to see what works for you. A time to play. 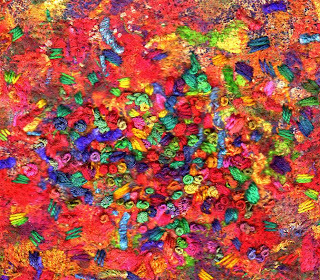 Scrumptious Surfaces – we will look at backgrounds created on the embellisher and build on the surfaces with hand and machine stitch. Creating Cloth from stitch and surface and a little knitting. 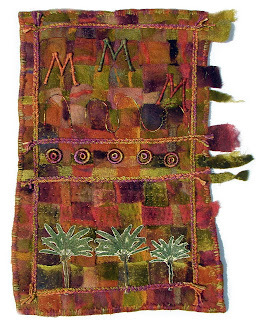 Bonding and Burning – how can you do a class with me without fusing and distressing? The Finale – some quick drawings, some design and execute maybe an amulet, a magic carpet, a vessel or wherever your imagination takes you. Email us (mail@thethreadstudio.com) to sign up and pay. We take Visa, Mastercard, PayPal or direct deposit. Then I will email you the requirements you will need and invite you to join a special Yahoo group set up specifically for this class. 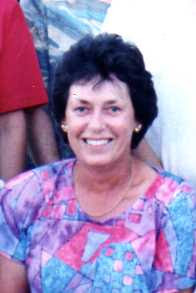 The lessons will be available on a weekly basis beginning Wednesday 4th June 2008 for 6 weeks. You will be able to share your questions and experiments with others on the Yahoo group and post pictures of your work. I will be there to answer questions and you can always email me of course. Lessons for this workshop will be available in .pdf format. I will email you each week with a link to the lesson which you will be able to download to your computer. You must have Adobe Reader 5.0 or higher to be able to open the lessons. Adobe Reader is a free software that you can download (http://www.adobe.com/products/acrobat/readstep2.html) It is more than likely you already have it on your computer. The six lessons and Yahoo group will be open to students enrolled for 4 weeks following the final lesson to allow you extra time to further work and interact. News just in - no pics found yet but Grant and Jarrad won the 14ft section of the Riva Cup on Lake Garda - don't worry Grant - I will keep up the daily inspections of your house! busy busy - what's new..
Ian is off to NZ tonight for a few days - it's Max's 70th birthday and Ken is going down to Reefton as well so it should be a good bash, eh Max? 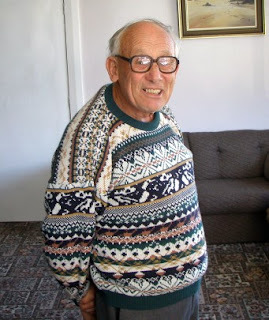 Ian has packed all his woollies including his wardrobe of beanies and his possum jerseys and socks. I have spent the morning learning how to be an accounts clerk - so far I seem to passed the test in producing invoices. If all else fails I shall just do them by hand.... Just so long as I get everyone's orders out. Nothing in waiting at present but a big post office basket all full and ready to go on Monday. Because Ian makes the coffee I will be at Lincolns at 7.30am to get my morning fix. That's my coffee at the bottom and Lincolns is almost as good as Ian - I wouldn't dream of competing. 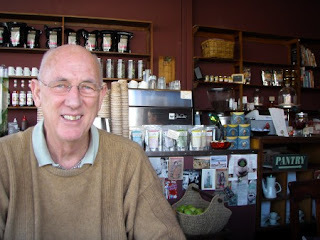 Here is Ian at Lincoln's today - it's our fabulous little cafe just around the corner. 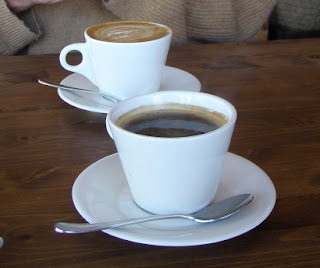 Sometimes we sneak off for a coffee during the day - that's when the answer phone is on. 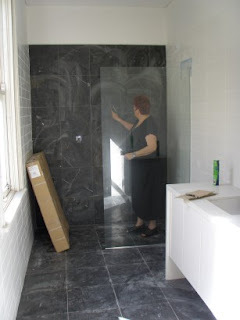 Then we popped around to do the daily inspection of Grant's - the bathroom tiles are down and the bathrooms nearly finished. The kitchen is almost there as well. 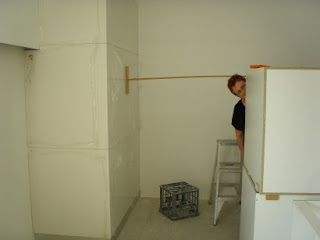 This is me in the kitchen peeping out from behind the cupboards. and inspecting the shower. The tiles are black marble. It's all looking good. 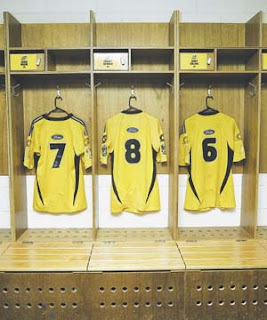 The rugby is getting exciting now - I shall only be able to watch half of the Hurricanes this afternoon as I have to chauffeur Ian to the airport and then get back to watch the Force/Chiefs game. Lots of teams pretty close in points. The preparation for the online embellisher class is going well. It won't be on the website before Ian gets back but I will email everyone who has emailed me with the info. I am pretty excited about it all and I have special extras for each lesson which will appear as we go. Wow - I must have hit a nerve with so many emails about an online embellisher class. So I will be running one starting 4th June for 6 weeks. Email me if you are interested in knowing when it is up on our website - shouldn't be too long - I am pretty excited about it - it be not so traditional and involve hand and machine stitch and plenty of enrichment. And of course there will be a Yahoo group for you to share your ideas and ask questions. This is my M for Holiday quilt (?) - it missed out on being selected so I can pop it here now.